Meanwhile, in deep nonstick 12-inch skillet, heat 2 teaspoons oil over medium-high heat until hot. Add mahimahi; sprinkle with 1/4 teaspoon salt and 1/8 teaspoon pepper and cook 3 to 4 minutes or just until mahimahi turns opaque in center, gently stirring. Transfer mahimahi to plate; set aside. In same skillet, heat remaining 1 tablespoon oil over medium heat until hot. Add garlic and cook 1 minute or until golden, stirring constantly. Add tomatoes; cover and cook 4 to 5 minutes or until tomatoes burst, stirring occasionally. Stir in wine, half of basil, 1/4 teaspoon salt, and 1/8 teaspoon pepper; cook, uncovered, 1 minute to blend flavors. Reserve 1/4 cup pasta cooking water, then drain pasta. 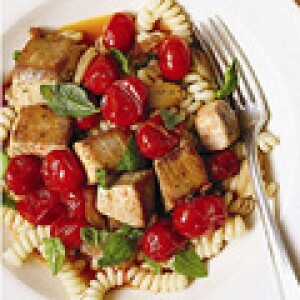 Add pasta, reserved cooking water, mahimahi, and remaining basil to tomato mixture in skillet; toss until well combined.